Our Local Enemies List. Is This Finally the End for Sheriff Joe? 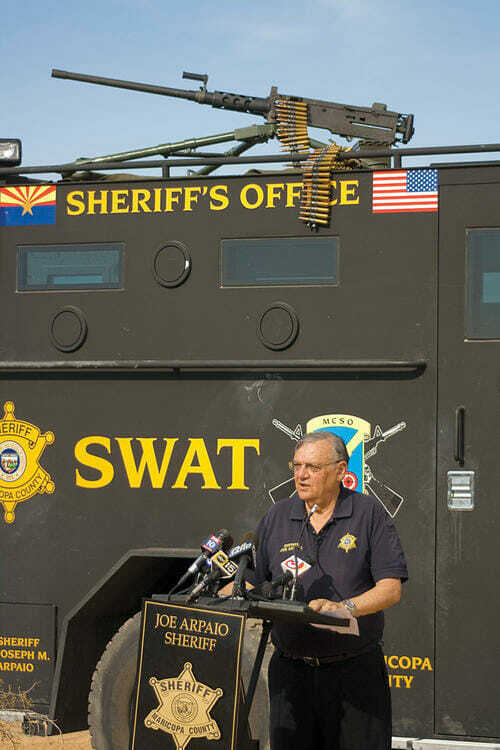 Folks in other parts of the country hypothesize that their politicians may or may not have enemies lists, but these are all, frankly, wimpy initiatives when compared to our famous Sheriff Joe Arpaio and his treatment of enemies. You see, if Sheriff Joe sees you as a political enemy, he brings you up on charges. When he came in conflict with his bosses, he and his buddy former County attorney Andrew Thomas brought them up on racketeering charges. When a judge failed to deliver the rulings he wanted in that case, he brought the judge up on bribery charges that fell apart even before the ink was dry (read about some of the hijinx here). Now there is an ongoing investigation of Sheriff Joe and his department around Arpaio's attempts to get a political opponent, one of his bosses on the Board of Supervisors Joe Stapely, brought up on charges. Or at least, be seen in the media as brought up on charges, because it is fairly clear that Arpaio was less interested with the strength of the case (which like many of his other political attacks fell apart nearly immediatley) as casting negative media attention on a political opponent. Money quote highlighted in bold, from the Phoenix New Times which has a great history of staying on Arpaio's case but does not write very well organized articles. About a month after the indictment, MACE [a division within Arpaio's organization] raided the offices of an associate of Stapley's, developer Conley Wolfswinkel. The claimed justification was that the Sheriff's Office was looking for evidence of additional crimes that detectives had uncovered in the disclosure-form case. Knight [leader of MACE] had reviewed the search warrant before a raid on January 22, 2009, and believed that he had enough evidence based on testimony from Stapley's bookkeeper, Joan Stoops, to carry out the raid. Stoops told detectives that it appeared Wolfswinkel had inked an agreement to pay Stapley hundreds of thousands of dollars in a land deal when Wolfswinkel had business before the Board of Supervisors. Knight said Sheriff Arpaio reviewed the search warrant personally — and asked Knight why he hadn't included more details about the case in the warrant. Knight, according to the report, told Arpaio that the details weren't necessary to establish probable cause, the legal term for the level of evidence needed to persuade a judge to sign a search warrant. The report doesn't specify which details Arpaio wanted Knight to add, but it does describe how Arpaio pressed him on the issue, saying he wanted to make sure the warrant would hold up. Knight didn't buy what Arpaio was saying, believing that the sheriff only wanted the extra information so he could sensationalize the case. "Are we writing a press release or are we writing a search warrant?" Knight said he asked the sheriff. "I just need to be clear on what we're trying to produce here." The sheriff stared at him and said sternly: "Get the information in there," the report states. Arpaio then got up and walked out. Knight did as he was told and included the superfluous information. He had the warrant signed and prepared his deputies for the raid on Wolfswinkel's Tempe business office. He recalled that Arpaio's right-hand man, then-Chief Deputy David Hendershott, called Knight numerous times, asking: "Are we in yet?" Hendershott, Knight stated, told him that as soon as the search warrant was signed, Knight was to go to the nearest Kinko's and fax a copy to sheriff's headquarters. "So we get in; we secure the place," Knight said to investigators. "I run over to the nearest Kinko's, which is three or four miles away, [and] fax the document over to him. "By the time I get back to Conley's business, I've already got a news helicopter flying overhead." Knight found out later that the search warrant had been handed to the media in conjunction with a press release. A news conference was under way before Knight got back to his office. Arpaio also tailored his public statement to emphasize the shocking revelation that Stapley and Wolfswinkel were being investigated in an alleged "bribery" scheme. The bribery story fell apart within days, by the way, as the officers realized they had the dates wrong on the land deal such that the deal and the supposed political payoff could not be related. Arpaio faces a myriad of charges. His defense was that it all happened without his knowledge, which is laughable given the way he is known to run the department. He is claiming in his PR that the whole department is created in his image but that he has no responsibility for what it does. Like any good mobster, he apparently had a consigliere named Hendershott who he is attempting to claim now was a loan wolf rather than Arpaio's right hand man, in order to deflect accountability. The entire article is worth a read for Arpaio-philes and phobes alike. It serves as a good summary of some of the worst excesses of Arpaio's reign.